They came. They showed. They sold machinery. The 2015 edition of the AWFS Fair in Las Vegas proved to be very good for Safety Speed Manufacturing. 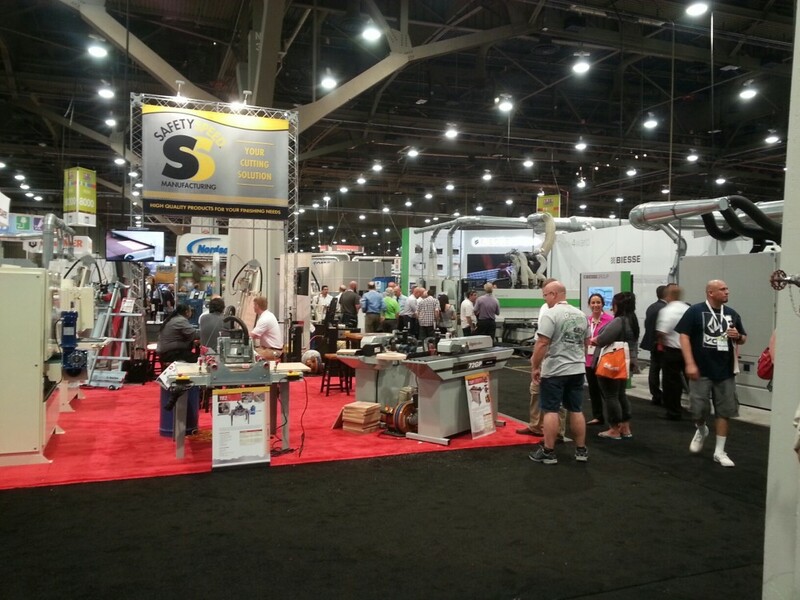 Even as the sawdust still settles on the four-day event held July 22-25 at the Las Vegas Convention Center, Safety Speed continues to rack up sales from leads it amassed at its booth. This is on top of several machines that Safety Speed personnel hung “SOLD” signs on before the show ended. Among the floor models that Safety Speed sold at the show was the 7400 Vertical Panel Saw, which incorporates a new and improved scoring system for making chip-free cuts. The newly designed scoring unit allows the operator to quickly adjust for changing substrate thicknesses or to move it out of the way when not in use. The device also lets operators to simply rotate the tooling when needing a sharper edge. Shawn Larkin, sales manager, noted that the floor models sold at the show represented a good cross section of Safety Machine’s product portfolio. In addition to the 7400 Vertical Panel Saw, Safety Speed wrote up on-the-spot orders for the H5 Vertical Panel Saw, 6400 Vertical Panel Saw, 7400 Vertical Panel Saw, SPM301 Screw Pocket Machine, 3760 Wide Belt Sander and 4375 Wide Belt Sander. For the record, AWFS Fair organizers say more than 10,500 wood industry professionals registered to attend this year’s show, a 15% increase over registration numbers for the 2013 AWFS Fair. Beyond the equipment displayed in its 800-square-foot booth, one of Safety Speed’s vertical panel saws was featured by TigerStop, one of Safety Speed’s partners. “TigerStop showed how one of our existing machines can be retrofitted with its SawGear automatic length measurement system for even greater efficiency,” says Safety Speed President Brian Donahue. Safety Speed reciprocated the favor by displaying a TigerStop SawGear at its booth. Larkin says Safety Speed personnel engaged in numerous conversations with woodworkers about its Model 72GP edgebander and its pocket screw machine, which have represented important additions to the company’s product line in recent years. Article written by Rich Christianson. Rich Christianson is the principal of Richson Media, a Chicago-based communications firm focused on the industrial woodworking sector. Rich is the former long-time editorial director and associate publisher of Woodworking Network. During his 30-year career Rich toured more than 200 woodworking plants throughout North America, Europe and Asia and written extensively on woodworking technology, design and supply trends.